Life may not be bowl of cherries for Mr. Trump’s presidential campaign these days. It’s more like a bowl of Skittles, as that is exactly what landed Team Trump in a copyright infringement suit filed in Chicago federal court on Tuesday. As it turns out, the copyright in the photograph is apparently owned by Mr. David Kittos, a U.K. photographer who posted the photo to his Flickr account back in 2010. (In a rather bitter twist of irony, Mr. Kittos was a child refugee from the Republic of Cyprus). He obviously soured on the tweet and submitted a DMCA “take down” to Twitter, which complied with its obligations and removed the Skittles pic. By that point, though, Mr. Kittos’ photograph had been liked and retweeted thousands of times. He registered his work with the U.S. Copyright Office, and asserted claims for direct and indirect copyright infringement against Donald J. Trump for President, Inc., Donald Jr., Donald Sr., and even Veep Candidate Michael Pence. Mr. Kittos seeks actual damages, disgorgement of Defendants’ profits, and injunctive relief. (There is no claim to statutory damages or attorney’s fees because Mr. Kittos registered his work after the act of infringement occurred). The Complaint raises a number of potentially interesting issues. First, it’s not entirely clear whether Plaintiff has viable copyright claims against Donald Sr. or Governor Pence. Neither candidate appears to have directly participated in the act of infringement. Moreover, there does not appear to be facts to suggest that the running mates had the right to control how Donald Jr. used or operated his personal twitter account. Second, is the photograph sufficiently original to receive copyright protection? Plaintiff explains how he exercised artistic judgment in selecting the angle, lighting, and “randomly placed” the candies into the bowl thereby “allowing their bright and boastful colors to become the centerpiece of the image.” Given that a “dash” of creativity suffices for copyright purposes, the Court is unlikely to be bowled over by a lack of originality argument. Finally, what about fair use? There is a recent case out of the Northern District of California where the Court held that reproducing a candidate’s “head shot” photograph in a blog post was fair use as a matter of law, even at the pleading stage. That Court’s analysis turned largely on the fact that: (1) Defendant used the Plaintiff’s head shot photo in a blog post that was “critical” of Plaintiff’s politcal views; and (2) the Plaintiff had no evidence to suggest the market value of her head shot photograph was adversely affected. 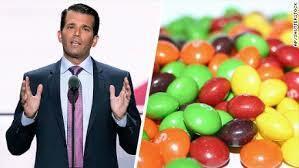 Here, Trump Jr. did not use the picture to criticize or comment on Skittles. Moreover, Plaintiff has alleged that he licenses his photographs, so there is a potential argument that the market value of Mr. Kittos’ work could be adversely affected. Thus, it seems unlikely that fair use will win the day, at least at this early stage of the pleadings. This tweet of sweets has come back to haunt Team Trump this Halloween season. They will likely answer or file a motion to dismiss sometime this holiday season. With any luck, we might know where this case is headed by Presidents’ Day. Sorry Beliebers, But Justin Bieber Has Been Sued For Copyright Infringement.